Make your Escape to the Ocean Pointe Estate. 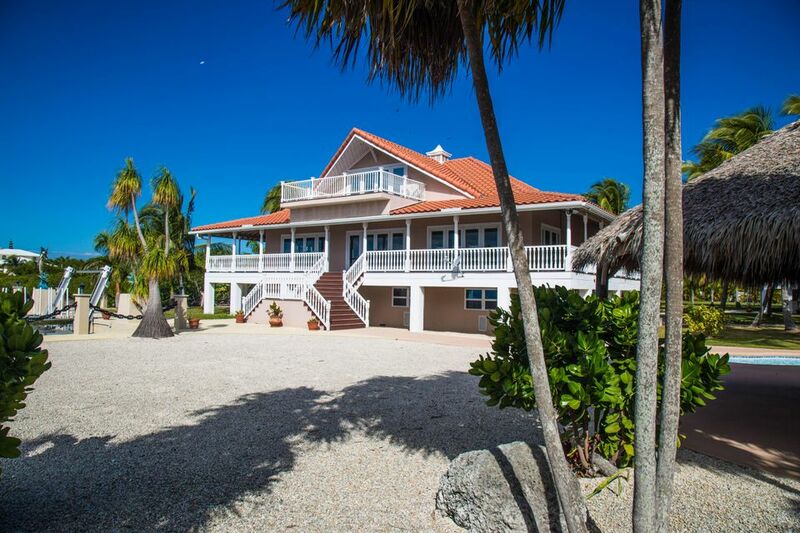 Tastefully appointed and beautifully decorated this tropical, oceanfront Estate with approximately 800 ft. of water frontage was renovated in 2011 and boasts spectacular unobstructed ocean views, CBS construction, Hardie board siding and new tile roof. The home features Key West Styling, with 3 full guest bedrooms, open living and dining room with expansive ocean views, Pecky Cypress ceilings and beams, custom tile flooring, impact windows / glass doors and wrap around covered porches. The kitchen has been updated with stainless steel appliances and spacious dining area. The master suite includes a private balcony with European open shower, dual vanity, spa tub and wet bar; all with breathtaking views of the turquoise waters of the Atlantic Ocean. All main level rooms open to balconies with over 1200 square feet of covered walkways. The glistening swimming pool and Tiki Hut entertainment center includes a custom wet bar and is surrounded by Caribbean waters. There is protected dockage with a 120,000 lb. boatlift (60 Tons), a second 14,000 lb. boat lift, boat davits, a private boat ramp, and a three car garage. The home includes an internet connected security system with cameras. Strategically located on Summerland Key midway between Marathon and Key West, Ocean Pointe is a unique destination for those looking to live a life of adventure and relaxation. Lot size and lot dimensions are approximate. Both are subject to final survey and Monroe County approval.